Craving a Combo Meal at The Melt in Palo Alto, my pal Summer and I hit the Stanford Mall this week, for grilled cheese sandwiches and to check out the latest in-store arrivals. We were melting in the 90+ degree heat, but every store in the mall was in full swing, and ready for fall! Our shoes? Both on sale at Nordstrom. Left on Suzanne, Paul Green ‘Hana’ (sold out on line). Right on Summer, Vince Camuto ‘Evel’, now $79.90, HERE. The ‘Evel’ makes for a great transition shoe, when you are ready for fall, but live in areas like us, with Indian Summers. Were there items you missed out on, or wished you had purchased, during the Anniversary Sale back in July? Many of those pieces are now on sale, for less than they were during the Anniversary Sale. For example, you may recall my obsession with the Joie animal print sweater. 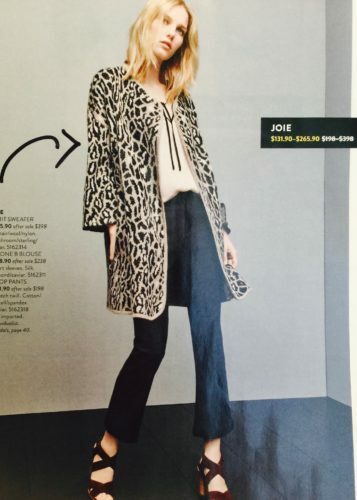 Joie ‘Berit’ Wool Cardigan, now 60% off. I love this sweater. Still in the bag, with all tags attached, I did exchange it, for the same thing at a lower price. It is a little itchy, but for me it will be fine. Note, it runs large and the XS I bought is plenty big. I plan to wear this piece more as a coat here in California. I love the 3/4 wide sleeve, which gives me loads of options as far as what to wear underneath. 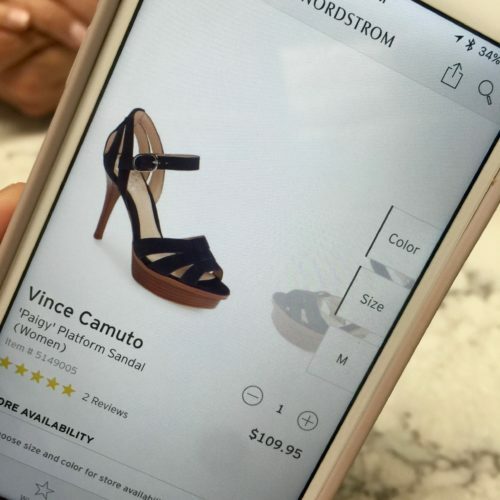 This is just one of many deep markdowns, happening now at Nordstrom. 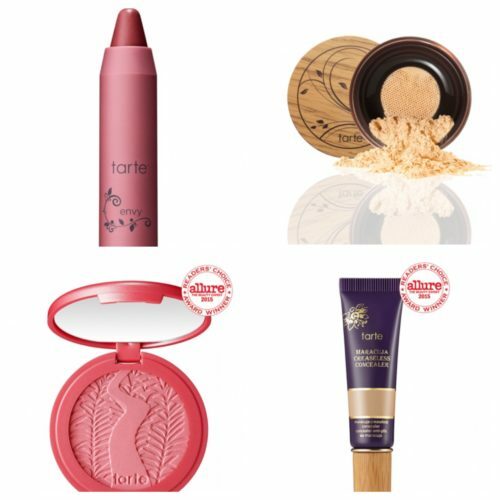 Just check your favorite brands, and see what’s on sale, you may be surprised! We both thought this Vince Camuto peep toe bootie, was a real winner! Block heel, deep suede color, flattering v-cut in the front. Pair this bootie up with skirts or denim. 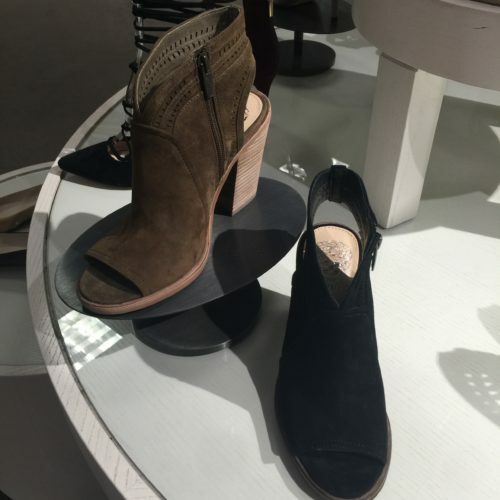 On the hunt for the perfect bootie? Click over to this weeks ASB Bootie Round-UP (HERE), for the full round-up! 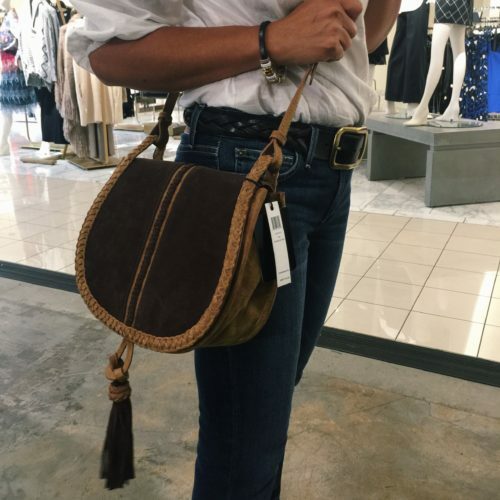 The ‘Koral’ pairs up beautifully, with this Steve Madden saddle bag. Um, kinda looks like Chloe, right? 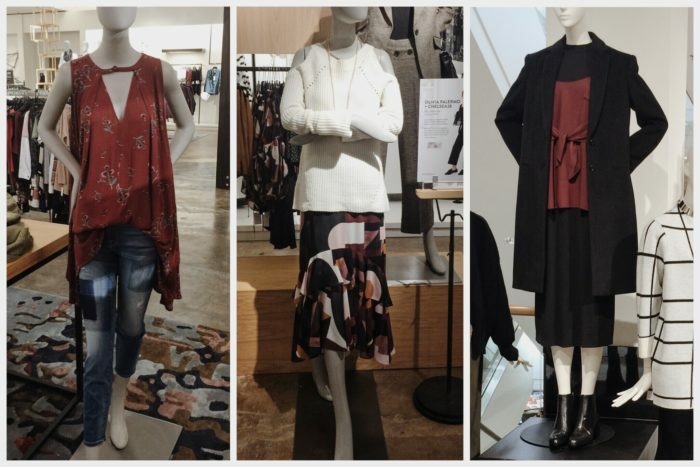 Some eye candy from Free People, Chelsea 28 and Individualist Department at Nordstrom. 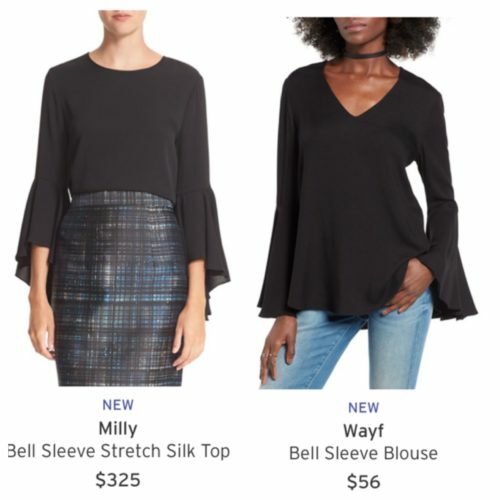 I’m obsessed with anything bell sleeved these days. Sadly on me, the upper arm was way too small, in the size small, and the shoulders too big in the medium. Luckily Summer was with me to try it on, it fit her perfectly. Determined to find my top, I tried on a few from Pleione. I know, my crazy pants and the top being a size too big, are killing the look here – try to look past it all. 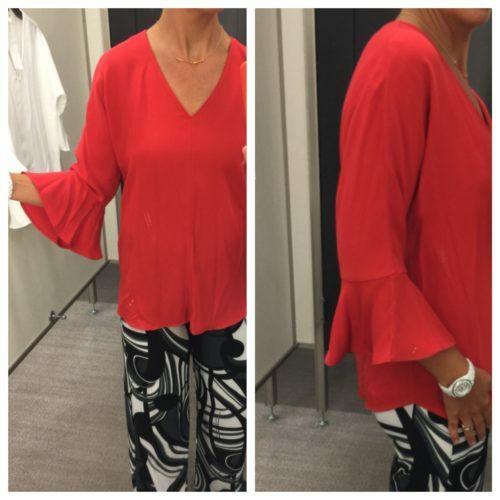 With this style of hem line, imagine this blouse tucked in, to a black or printed pencil skirt. This top on the other hand, I would most likely tuck out. It’s more of a tunic style with side slits. 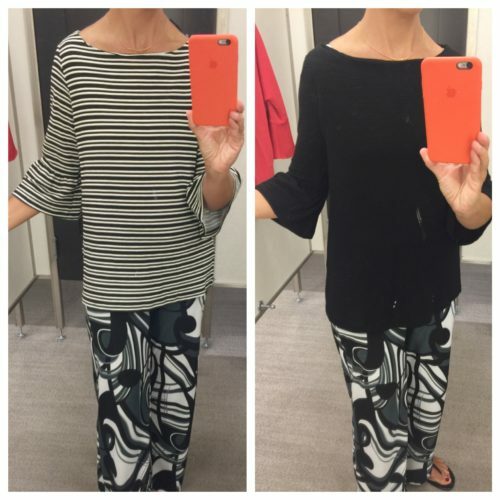 Pleione Stripe Knit Bell Sleeve Top | $49.00 | HERE (love the black and white combo). FIT TIP: Both Pleione tops run large in my opinion. With the exception of the black top, above right, I am wearing a small, and you can see they are too big. 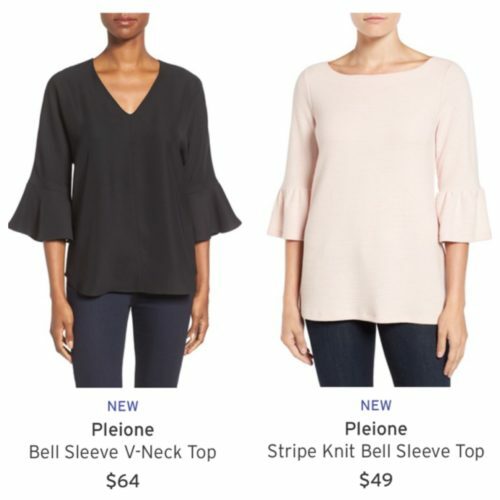 I would need to size down to a XS in both tops by Pleione. Both tops appear to be hot sellers. 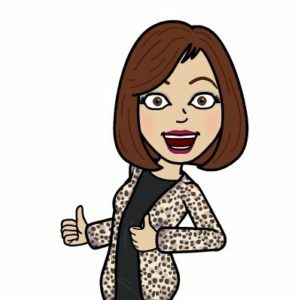 XS was sold out online – my sales gal needed to track one down for me! Thank you Brenda, you are awesome! Now ladies, these 3 tops are NOT all the same. I created this style set, to show how I would style each of them, for different occasions. Which top, best fits your lifestyle? for links to all pieces in above set, click photo to connect to the full Polyvore Set. An AskSuzanneBell Reader told me she picked up this body suit and loves it. 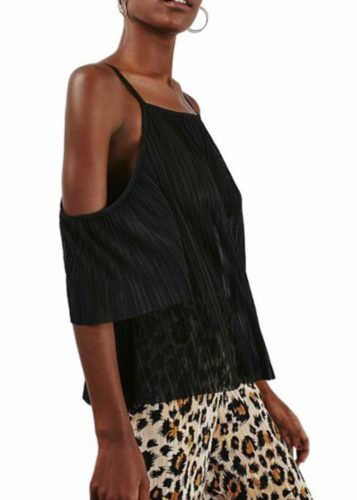 Summer purchased the Pleated Cold Shoulder Top | $50.00 | HERE. Note: this top is sheer, you will need a cami underneath. 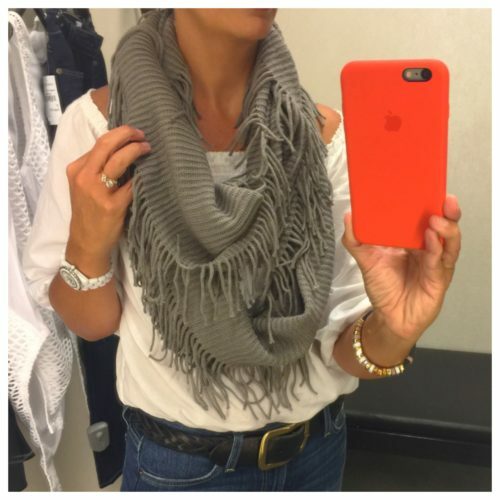 This $19.00 fringe infinity scarf has been an AskSuzanneBell must-have for years. Last week, an ASB Reader asked me to re-link it. Cindy, here you go! Like a necklace, just throw it on (probably not over a white off the shoulder summer blouse) – and boom, you are accessorized! Super soft and only $19.00 | in 6 colors | HERE. PS it makes a great gift! Later the same day, another friend flashed me this shoe on her iPhone. Already wore it and LOVES it! The 1″ platform takes the height to 3″, making it comfortable and walkable. 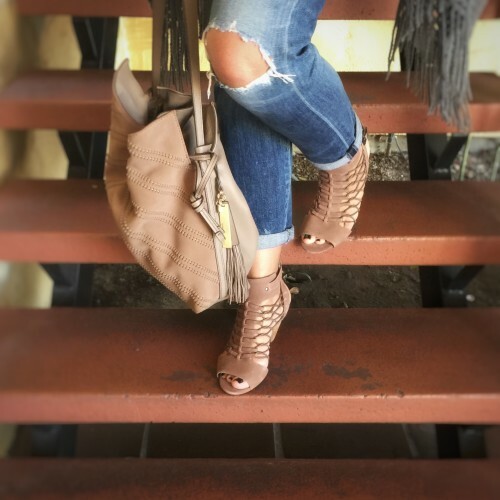 PS She also purchased the Vince Camuto Peep Toe Bootie above…this gal knows her shoes! Low on blood sugar, we got ourselves over to the Melt. Refuled, we popped into Banana Republic, to check out a few new arrivals. 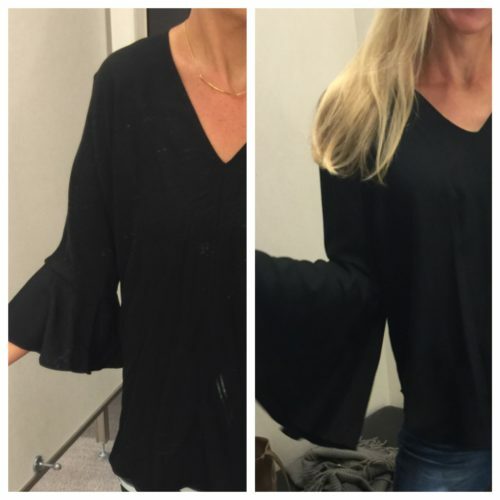 The sweater, was not yet stocked in store, but I did try on the flutter sleeve top, which I thought ran true to size. 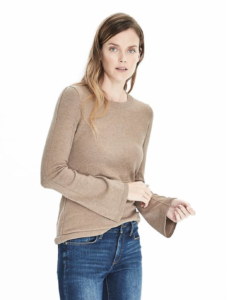 With the 40% off promo they had going on, I ordered the sweater in camel, and the top in ultramarine. 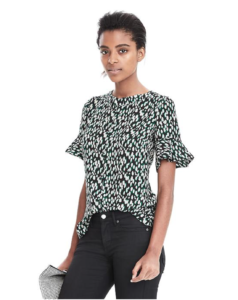 I plan on wearing this blouse with black bottoms, and my leather skirt. The sweater I’ll pair with denim, as well as black bottoms. Stay tuned. On the way out, I spotted these cross-body bags. Neither are online to link, but there was stock in the Palo Alto store. 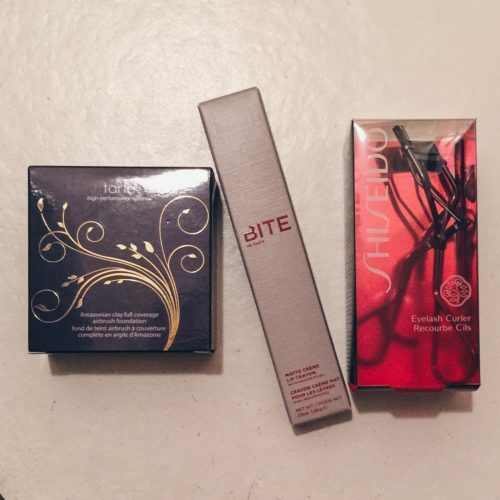 With a little time left, we popped over to Sephora. For those of you who miss your no-longer-available-at-Sephora, Shu Uemura lash curler, I was told to try the Shisheido eye curler. I tried it out this morning, and it does do the trick. Back home to Google, I just found the Shu Uemura is available online, HERE. Do you have a favorite eyelash curler? I also picked up a new tube of my fave lipstick by BITE in ‘Brandy’ | HERE. What trend are you obsessed with this season? 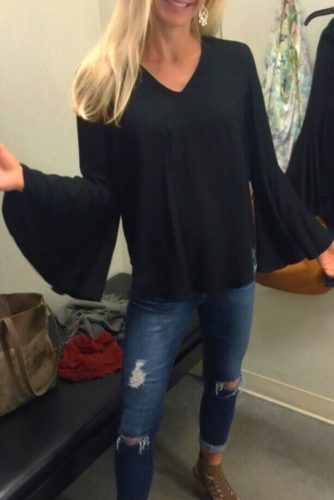 What are your thoughts on the bell sleeve? Are there pieces you have your eye on, that will bounce life back into your closet? Any new beauty products you’d like to share with ASB readers? Drop me a line down below, I love reading your comments and readers do as well! I’m off to clean my closet, need to make some room! Need some direction in cleaning out the closet for fall? 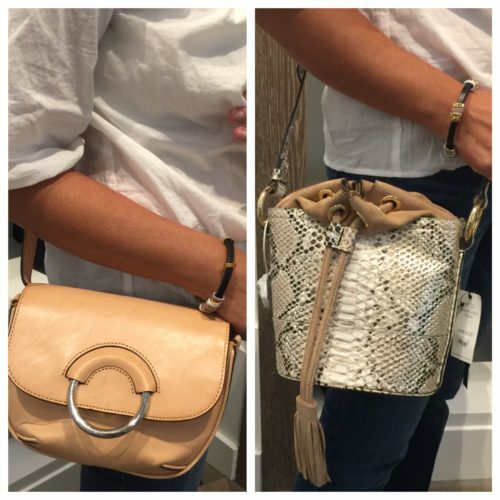 Click on over to the Ask Suzanne Bell Closet Edit HERE. Sounds and looks like a fun shoppIng outing, suzanne! Love all the dressing room picKs & info on the items! I’ve never been to the Melt – i’ll have to ChecK it out one of these days!